If you are gardening for beginners, then you just may be wondering where to get started. Well, Ellen Zachos has the perfect solution for you… get Down & Dirty. With her garden project book, designed specifically for beginning gardening, she offers step-by-step activities to get you started and complete a wonderful project at the same time. 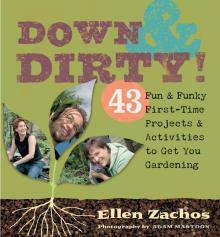 Ellen Zachos delightfully practical book, Down & Dirty (Storey Publishing, 2007), will inspire you with 43 different fun and funky projects designed for the novice. Ellen's how-to guide offers such a variety of activities, you are sure to find one for your specific garden situation. With detailed pictures and easy instructions, you can learn to make a dinosaur garden for your kids, discover basic techniques, or brighten your winter blahs with a window box. A book for the whole family, if you are gardening for beginners, then this is the book for you. LoveToKnow had the opportunity to talk with Ellen and learn more about her book and her advice on getting started with gardening. Gardening is therapy in many ways - get outside, get your hands in the dirt, forget about what is on the computer or the notes on your desk. It is also a family activity and a fun thing to do with your kids outside. Additionally, from the practical standpoint, it makes your garden or yard a nicer place to be. If you plant a nice garden, your house will be worth more when you sell it. But, even if you only have a condo or a garden on a front stoop, gardening is a wonderful way to beautify your outdoor space. You can even get fresh herbs and vegetables that way. There really are so many reasons, from the practical to the aesthetic, to begin gardening. What if you only have a small or non-existent yard? All of my clients are in New York City and most of the garden plots are either small brownstones or balcony and rooftops. If you have a small space, start thinking about containers. If you really are gardening for beginners, then maybe it is just a window box with herbs. So, then you can just reach out and grab a sprig of basil or rosemary while cooking. Or, if you have a bigger back deck and like to BBQ, consider planting a small tree in a container. It is a project I do in my book. It is a very simple thing to do and there are a lot of trees that will grow really well in containers, plus provide some shade on a back deck and help you feel like you have some yard back there. The first tip is that container gardens need to be watered more often then if you were gardening in the ground. You certainly don't have to be a slave to watering, but it is important to be aware of your plants' needs. The second thing is that you can put a container wherever you want, which offers some nice mobility. So, if you do plant a container tree and you don't like where it is, you can move that container. Additionally, it is much less intimating for a beginning gardener to plant a few containers than landscaping an entire yard. When you are gardening for beginners, it is much easier to get started if you can break it down into smaller sections. What if you have a larger yard, where is the first place to start? I would always start with trees and shrubs. Get the big things done first, and let them start growing. If you have a budget and only have $1000 to spend on your yard that year, just purchase a couple of trees and start there. Work from the big to the small. That will make it easier for you. What is a brief overview of your book and who would benefit most from reading it? 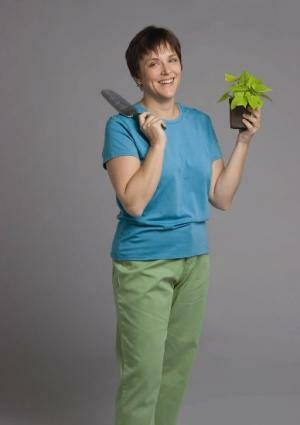 The subtitle of my book pretty much says it all: 43 Fun & Funky First-Time Projects & Activities to Get You Gardening. It is a project book for beginning gardeners, who want to get started, but don't know where to begin. The book has some indoor and outdoor projects, most of them plant oriented, but a few are just outdoor activities. For example, one project is building a fire pit, it could be something you can have to just sit around and enjoy on a summer evening. There are also some recipes for using things you might grow in your garden and there is even a project designed just for a Cat Garden. The plants and activities are for all parts of the country as well. There should be something for everyone there. What is the one thing a beginning gardener finds the most difficult? How do they solve it? The biggest hurdle in gardening for beginners is to understand light. Many new gardeners don't understand the difference between direct and indirect light or full sun and filtered light. Many believe full sun means 16 hours a day, but in reality 8 hours is considered full sun. Plus, people often don't understand how important light is to a garden. If you plant a full sun plant in a shady spot, no matter what you do, that plant is not going to thrive. So, the most important thing is to understand your growing conditions and choose the appropriate plant. Nothing makes you feel better about gardening than being successful. What about time saving gardening tips? My main recommendation is to use a drip irrigation system, instead of having to hand water. A simple set up is more efficient, it saves water, and frees up your time. It can be easier than people think to set it up. You can find simple kits on the web or hardware store and create one yourself. What do you hear beginning gardeners say about the joys of finally getting down and dirty? I find there are two things that people especially enjoy about finally getting out and gardening. The first one is enjoying the fresh vegetables and herbs you grow. Especially if you have kids, they get so excited about starting with a little seed and getting food. The other thing is cut flowers. If you are someone who likes to do flower arrangements or bring a casual bouquet indoors, it can get quite expensive going to the flower store. But, a cut annual flower garden is actually quite inexpensive and easy to do. The most important thing I really want people to understand is that gardening is not brain surgery. It is really simple and within everyone's grasp. I have really tried to make this information accessible and encourage people to really get out and try gardening. Disclosure: A review copy of Down & Dirty was provided by Storey publishing for this article.